2016 Mission: Bringing back the METAL! “Tattoo for Sarah” – Custom, hand cut kiln formed glass; hardware fabric and industrial parts. Approx. 8″ sq. Wrist cuff of leather, copper and stained glass. We started by checking out a set by metalcore band, Play the Victim, to welcome into the family our new 19 year old, vocalist nephew. Great set at Rocketown in Nashville and proud to have another metalhead in the clan! Check out this track http://playthevictimtn.bandcamp.com/track/catalyst and show ’em some love on their facebook page. Gotta keep an eye on the up-and-comers! This week we raged on at Lamb Of God’s “Sturm und Drang” tour with the mighty Anthrax at Marathon Music Works. KILLER show that also included the band Power Trip who put in a thrashin’ performance. Next month, the relentless, “Repentless” SLAYERRRRRR!!!!! https://www.wmarocks.com/events/detail/slayer-2016-wma. Shout out ya’ll to let us know you’ll be there and we’ll hook up! We’re on the prowl for future show dates and scheming ways to connect with YOU…we and 68 Artwork Cubed initiates did some major connecting at the July 2015 show. Here’s the coin (logo on reverse) they all got and me, post-show, with a sample of some of the love…washable ink stamps of my logo, one for them…68 for me! We need you to continue to connect and inspire with us to create awesome new designs to bring to the Nashville metal community. We know you’re out there! Help us bring the 2016 metal evolution and let’s ride! This entry was posted in Art Events, Kiln Formed Glass, Metal & Mixed Media Sculpture, Wrist Cuffs and tagged art, family, fused glass, Gifts, Heavy Metal, Inspiration, kiln formed glass, Motorcycle Riding, Motorcycles, New Designs, socially engaged art, water on January 22, 2016 by aeshep. I kicked off the new year by creating a piece I started in 2011 that was originally intended as a wedding gift for our nephew Daniel and his talented wife Eden (Eden Frangipane Photography). Things were going splendidly when suddenly the muses fell silent. Something was missing, elusive, beyond me. Maybe I would finish it for their third anniversary, but no, still it was not yet time. Until recently…. Then the moment came. The couple has brought forth a new soul, their first child, daughter Basil. And the muses sang, now they are three! “Souls”: Wedding gift. Kiln formed glass, photo transparency, leather, copper. 8″x8″x1.5″. Back, “Souls” : Quote from rehearsal dinner invitation. Serendipity graced us when I presented it yesterday: with Basil’s parents, grandparents and great grandparents all present on Mimi’s birthday (her great grandmother and my loving mother-in-law)! I was delighted to meet and hold sweet Basil and, as icing on the cake, the piece coordinates with the decor in her room so they plan to display it there. All things in good time, indeed. The muses are smiling. I am happy and thankful. It is one of my favorite pieces. This entry was posted in Kiln Formed Glass, Metal & Mixed Media Sculpture, Uncategorized and tagged Artisan gifts, baby, custom mixed media, enchanted forest, Gifts, Inspiration, kiln formed glass, love, serendipity, souls, transformation, wedding on January 19, 2016 by aeshep. Pictures speak volumes! Here is my wonderful evening as a presenter for ARTable. Thank you Nashville Arts Magazine and Paul Polycarpou for the coverage and fun auction. My sincere gratitude to Matt Fischer (Picture This) and Deann Bradford (Leadership Donelson-Hermitage) for this opportunity; and to Danielle “The Clay Lady” (Clay Lady Studios) and Tami Archer (Mid-South Ceramics) for being such gracious hosts at their gorgeous campus. Thanks also to everyone who helped and to those who came out in support! I hope you all enjoy your new artworks! More pieces are available now at Picture This (my gallery page on their website is being updated as I write). In the meantime you can browse my website under Current Work for info and pricing. Let me hear from you and be sure to share pics! Contact me here or at Artwork Cubed on Facebook and enjoy your fall season! Getting close to start time. 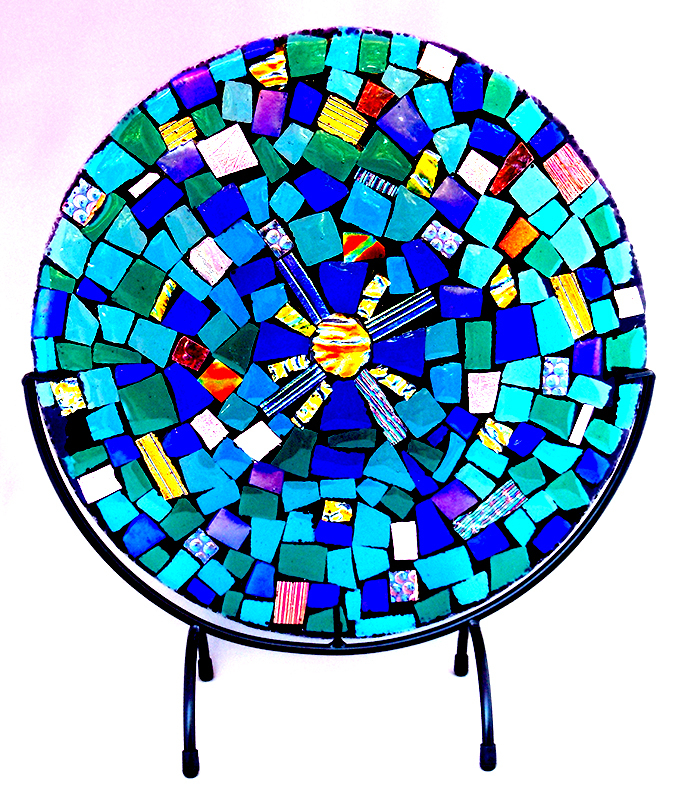 Sunburst Mosaic: Chosen by Deann Bradford of Leadership Donelson-Hermitage for the “Arts at the Airport” permanent collection, Nashville Internat’l Airport! “7 Chakras” (tall center), Auction Piece SOLD! This entry was posted in Art Events, Uncategorized and tagged art, art event, art exhibit, Artisan gifts, arts, Birthday Gifts, fused glass, glass art, Holiday Artisan Gifts, kiln formed glass on October 21, 2015 by aeshep. Fused Glass Mosaic Chosen for Permanent Collection!!! I am absolutely thrilled to announce that during my presentation at ARTable last Saturday night, one of the pieces from my new “Astral Musings” collection was chosen to become part of the permanent collection for Nashville’s “Arts at the Airport“! I am deeply humbled by this privilege. My sincere thanks to Deann Bradford (Exec Director, Leadership-Donelson Hermitage) and Matt Fischer (Chair, Metro Nashville Arts Commission) for this honor. And uncharacteristically at a loss for other words to express my gratitude and excitement! Stay tuned for more info and pics of 2015 ARTable!!! This entry was posted in Art Events, Kiln Formed Glass and tagged art, Art Awards and Honors, art event, art exhibit, Art Presentations, glass art, kiln formed glass, Mosaic fused glass on October 14, 2015 by aeshep. “EM·BOD·I·MENT”- My spectacular evening at OZ Arts Nashville! Fountain close up: Fused glass, blue color from copper leaf in kiln formed glass. Poet’s handwriting fused into glass. I’m still basking and processing it all. Stephanie Pruitt has pulled off the season’s most smashing art soiree! Pre-ticket sales were record setting and last check there were over 600 visitors! Wow! What a whirlwind immersion experience. I reconnected with folks I haven’t been able to speak with in a while and made some new friends, too. I can’t thank Stephanie and everyone at OZ Arts Nashville for this unbelievable opportunity. Here’s the poem we all interpreted, by Stephanie Pruitt. My piece represented the lushness of alliteration in the phrases “the floats and falls” and “shadow and shine”. The recirculating water was a metaphor for “The End is an invitation to begin”. Ask questions both obvious and obscure. how most simmered pots of good vs. evil are an unseasoned soup. Notice what is there and not. Notice patterns. Notice what you notice. and the freedom of a blank page that can paralyze. remembering The End is an invitation to begin. 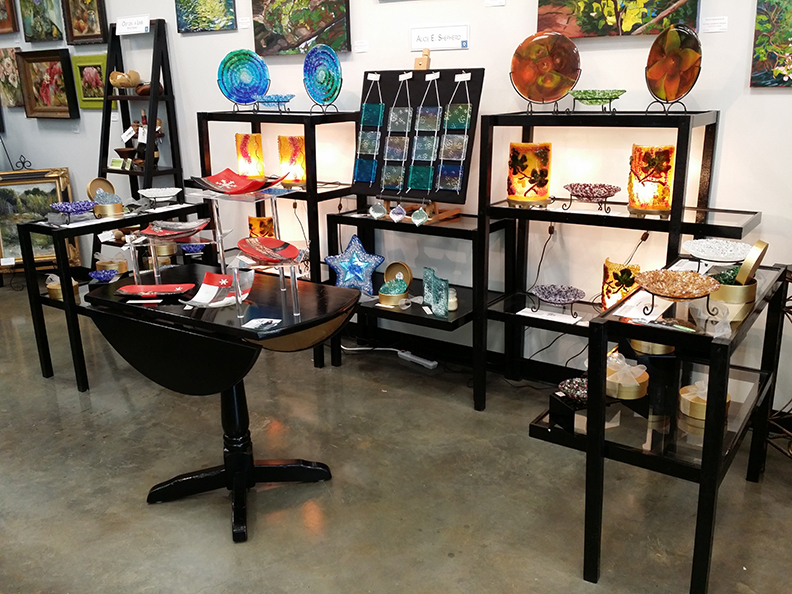 This entry was posted in Uncategorized and tagged art, art event, art exhibit, fused glass, kiln formed glass, OZ Arts Nashville, processes on July 25, 2015 by aeshep. My latest project hangs 34″ long, weighs app. 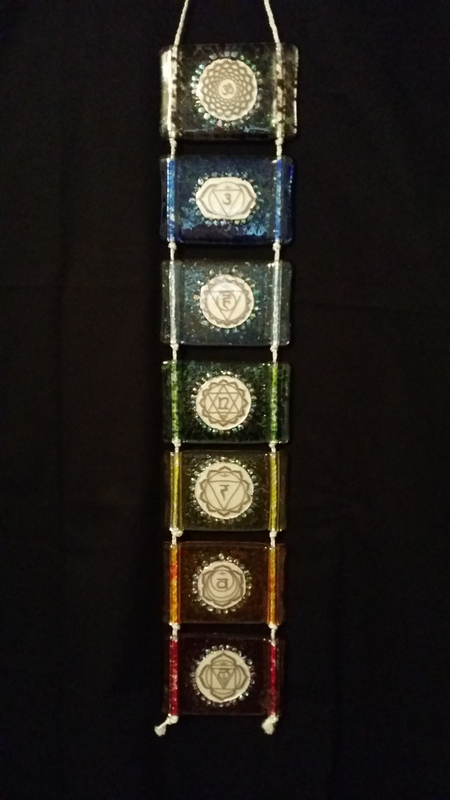 5 lbs and is comprised of seven pieces (each 4″ x 6″) to represent each of the chakras. This original design is in honor of my cousin, Tammy Dunn of Elementals Massage (http://www.elementalsmassage.com) who, in less than 3 years, has completely reinvented herself and recently moved into her new massage therapy suite at One2Yoga (http://www.one2yoga.com). The piece will be donated to her professional organization, the AMTA (American Massage Therapy Association) for a fundraising auction at their annual conference. Here it is on both white and black backgrounds. Here are a few process pics. Enjoy! This entry was posted in Uncategorized and tagged art, Facebook, fused glass, kiln formed glass on March 11, 2015 by aeshep.